eBay Seller Hub is the single go-to destination for professional sellers. In Seller Hub, you'll find marketing guidance and analytics insights that will help you to make informed decisions and grow your eBay sales. Seller Hub can help you fulfill orders promptly and quickly respond to any buyers questions and requests. Including direct access to Seller Dashboard with detailed reports to help you monitor your seller performance. From August 2017, business sellers will no longer have the option to opt out of Seller Hub. 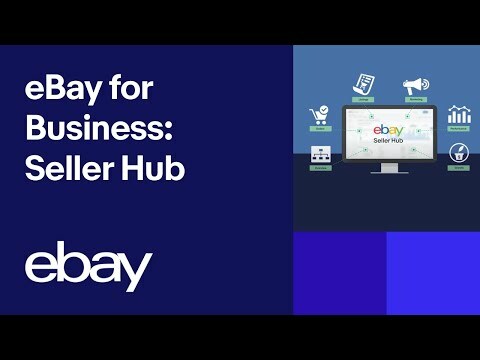 eBay Seller Hub helps you to manage and run your business on eBay. Why did eBay introduce Seller Hub? Sellers told us they're looking for a selling environment that's easier to navigate around and use. Now you can run your entire eBay business, end-to-end, with everything you need to manage it in one, easy-to-reach destination. What are the benefits of moving to Seller Hub? Which tools are included in eBay Seller Hub? Is Seller Hub free to use? Yes, Seller Hub is free to use and includes listing, reporting and order management functionality. Exisiting Selling Manager Pro subscribers will continue to be charged $10.95/month incl. GST and will have access to Seller Hub. Selling Manager Pro remains free for all Store subscribers. If I try Seller Hub, can I opt-out and revert back to the previous experience? From August 2017, sellers will no longer have the option to opt out of eBay Seller Hub. It'll be the single go-to destination for professional sellers. The page is too busy or is missing information, can I change what I am seeing? Nearly every page can be changed to suit your needs by using the “customise” button on the top right side of most pages. This gives you the option to choose what information you wish to see in each tab and arrange the order it appears in. In the Orders and Listings tabs, customisation is available by picking which columns you want to view and arranging in the order you want them to appear. Once you click apply you can adjust the column width by clicking and dragging the title of any column. Where can I find my Orders and Listings in Seller Hub? Orders and Listings tabs can be found in the grey bar at the top of the page. The headings in the grey bar at the top of the page are the different tabs available to view. Click on these headings to visit that tab. The tab you are currently viewing will be underlined in the menu. The ‘Orders’ tab contains information about your sold items and postage. The ‘Listings’ tab contains information on your items for sale. You have further options in the left hand navigation bar when you click on any of the tabs or hover over the headings in the grey bar. Where are my account settings, the resolution centre or the holiday calendar? Your account settings are not in the Seller Hub page. On the top of the page hover over ‘G’day Your Name’ and the option to go straight your account settings will appear in the menu. To visit the resolution centre, go to the Orders tab and in the left hand menu click on Cases. This will take you directly to the resolution centre. To manage your holiday settings, click onto the Marketing tab and click ‘Holiday Settings’ under ‘Manage your brand’ on the top right hand side of the page. What is the total value of my Orders or Listings? Click on the Orders or Listings page and scroll down to the bottom of the page to see the value of the listing displayed on that page. How can I manage the items I’m selling in other countries? You can now manage your overseas sales by toggling the ‘Listing Site’ dropdown in the Seller Hub header. Each market is represented separately and sales appear in the local currency. My sales data is incorrect and where is my sales history? The sales data shown in the Overview and Performance tab contains the value of your items sold including postage. In the Orders tab you can select the option ‘Paid and sent’ and set a timeframe of your choice to view your orders by ‘Sold’ price and ‘Postage Cost’ separately. Can I download my sales history? Yes. Go to the Orders tab and click Change Status to view ‘Sent’ or ‘Paid and Sent’ items. Then click the box labelled ‘Other Actions’ and select the option ‘Download’ to receive a csv (excel) file of your sales history. On the right hand side of the page there is the heading ‘Messages’. Click here to go to your inbox. In the ‘Overview’ tab, the ‘Tasks’ box will also alert you to urgent messages.